Canadians head to the polls today to determine their next prime minister in an election that could spur a dramatic U-turn on energy policies critical to the United States, from the Keystone XL pipeline to regional carbon trading. Prime Minister Stephen Harper -- who has been in office nearly a decade and is derided by environmentalists for his climate and pro-oil positions -- is in an intense political fight against Justin Trudeau, the 43-year-old leader of the Liberal Party and son of former Canadian Prime Minister Pierre Trudeau. Current polls show Harper's Conservative Party lagging behind the Liberals, who have pledged to undo many of the prime minister's energy and environmental policies and to push for a "pan-Canadian framework" for combating climate change. 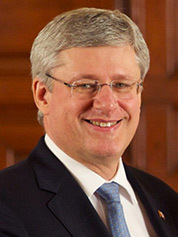 Stephen Harper, Canada's prime minister. Photo courtesy of Wikipedia. While many of the Liberals' plans remain unclear, and there is the prospect of a messy coalition government, analysts say a Trudeau government would mean less of a focus on Canadian oil and a stronger push for clean energy and action on climate change. "A Harper loss will send a strong signal, ahead of Paris and to Republicans in the U.S., that climate inaction is increasingly becoming a losing political strategy even in developed countries with large fossil fuel resources," said Paul Bledsoe, a former Clinton White House climate change official. "A Trudeau government is also likely to push national carbon pricing, increasing both opportunities for U.S. states to combine carbon markets with Canada and the potential of a pan-North-American carbon market." Supporters of Harper say that he would be stronger on the economy at a time when the oil industry is struggling and that there is no guarantee the Liberals would change the country's emissions trajectory much. 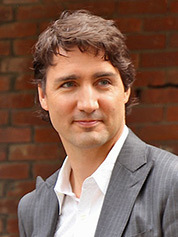 Justin Trudeau, the leader of Canada's Liberal Party. Photo courtesy of Wikipedia. Under the Canadian system, the prime minister typically is determined by which party wins the most seats in Parliament. However, if one party does not win a majority of seats outright, it must form some sort of an agreement with other political parties to move its agenda. This year, the Liberals and New Democratic Party (NDP) are expected to band together and try to remove Harper from power anyway in the case he wins without a parliamentary majority. "In many respects, this is one of the most unusual elections ever," said Duane Bratt, a professor in the Department of Policy Studies at Canada's Mount Royal University, noting a high disapproval rating for Harper and the animosity from the two parties. It's also been an unusually negative campaign, with the Conservatives raising the prospect that a Liberal victory would lead to brothels and marijuana sales to children, he said. Harper has been a target of environmentalists for most of his tenure -- they say he turned Canada into an international pariah by not regulating greenhouse gases from oil and gas, cutting clean energy and climate science programs, withdrawing from the Kyoto Protocol, "muzzling" scientists, pressing aggressively on Keystone XL and fossil fuels, and allowing the country's emissions trajectory to spiral away from targets under the Copenhagen Accord. "A Liberal government will publicly state that climate change is one of the major challenges facing our country. Conservatives don't believe that," said Keith Stewart, head of the energy campaign at Greenpeace Canada, in a common environmentalist complaint. Several climate and energy policies could change quickly under a Liberal government. Liberals have pledged to consider greenhouse gas impacts in approving major projects like oil pipelines -- something the Conservatives opposed. The Liberals support Keystone XL but say Harper's staunch support of the project damaged relations with the United States and actually hurt the oil industry by spurring so much environmental backlash. "Mr. Harper has turned the oil sands into the scapegoat around the world for climate change," Trudeau asserted in an August debate held by Maclean's. The Liberals have called for more stringent environmental reviews of new oil pipelines, which could affect proposals like TransCanada Corp.'s Energy East line. They also are opposed to another major proposed oil pipeline that would reach Canada's west coast, Enbridge Inc.'s Northern Gateway. They support the phasing out of fossil fuel subsidies in the "medium term" and pledge a huge boost to renewable energy, including through a new $2 billion "Low Carbon Economy Trust" to fund clean energy projects. The "pan-Canadian framework" on climate change is not fully fleshed out but does call for a national meeting with provinces within 90 days of the Paris climate conference in December to establish new national emissions targets and "targeted funding" to provinces to meet those targets. That could include more provincial carbon pricing and incentives for phasing out coal. National emissions targets based on the science of climate change "would be a significant difference," said Dale Marshall, an energy analyst at Environmental Defence Canada, which has not endorsed a candidate. A Liberal government also would be much more likely to fund climate science programs, said James Turk, a visiting professor at Ryerson University who has criticized Harper's approach to science policy. The Harper government, for example, slashed funding for Arctic climate research and for a major environmental research station, the Experimental Lakes Area. Advocacy groups like Democracy Watch also have claimed that the government "muzzled" scientists by changing media relations policies at federal agencies. While it's not clear how quickly Liberals could reverse these actions, things would not "continue to get worse" with them in power, said Turk. 'A lot of propaganda' about Harper? Harper maintains that the environmental criticism is misleading and that his party is the best protector of the economy, including the energy economy. He points out that Canada's economy grew while key climate regulations were enacted on coal and other sectors and alleges that the speeding up of oil pipeline approvals was necessary to end a process that used to drag on indefinitely. At the Maclean's debate, Harper scoffed at the notion that a failure to be more aggressive on climate change damaged U.S. relations and led to President Obama's delays on Keystone XL. "Absolutely not. The president has never said that to me. ... Let's remember, the United States has not even agreed yet to -- to have greenhouse gas emission regulations on their own oil and gas sector," Harper said. Kenneth Green, a senior director in the Center for Natural Resource Studies at the conservative-leaning Fraser Institute, said the idea that Harper has made Canada into a climate pariah is "a lot of propaganda." "The issue is not whether Canada's done enough on climate change, it's that energy production is such a huge element of the Canadian economy, there's not much they can do to achieve rapid reductions of the sort that climate activists are demanding. Nobody, in any province, or federal government ... is going to let their entire economy be decimated," said Green, who has not endorsed any candidate. He noted Canada's "wildly different" fuel mix from province to province, with most of the fossil fuel development centered in Alberta and Saskatchewan, makes it difficult to establish a one-size-fits-all policy. There is no federal control over natural resources in Canada that's comparable to U.S. EPA, as natural resources are owned by the provincial governments. In an editorial titled "Trudeau's hypocrisy on climate change," the Toronto Sun made a similar point, arguing that Liberal governments before Harper missed emissions targets, too. That past record is one reason many environmentalists -- while saying the Liberals would be more aggressive with clean energy -- also talk about the party with a degree of skepticism, noting the party's history of supporting infant industries, including the oil sands back in the early 2000s. Broad national energy policies like a carbon price might be a challenge if Trudeau becomes prime minister. For one thing, there is the baggage associated with the National Energy Program backed by his father decades ago that taxed oil and created a lot of bad blood with Alberta, said Barry Rabe, a professor of public policy at the University of Michigan and Wilson Center policy scholar. While the party is to the left of the Conservatives, it's also a very pragmatic one with eyes on public opinion, said Rabe, comparing its positions to those of moderate Democrats in the United States. Regardless, today's vote could lead to political chaos, considering that polls indicate neither the Conservatives nor Liberals are likely to win a majority outright. If the Conservatives get the most votes, but not a majority of them, "it becomes complicated, very quickly," said Bratt about the prospect of the Liberals and NDP trying to remove Harper from power after the election through a no-confidence vote. If the Liberals come to power without a majority in Parliament, it's a more stable situation, but they will have to do a lot of negotiating with other parties on energy issues, and it's not clear how much they could move their agenda, according to Bratt. The party that Liberals might partner with on some energy issues -- the NDP -- supports a cap-and-trade system and has policy positions on climate change that are generally more to the political left. For Stewart of Greenpeace Canada, that raises the prospect of the Liberals being steered toward emissions-cutting policies in the case of a less-than-majority victory. The Liberals "are not going to spend a lot of political capital unless someone pushes them hard to do so," he said.